Bright, young scientists with innovative ideas participated in the international Stockholm Junior Water Prize (SJWP) competition, held during World Water Week, Aug. 26–31. Teams representing 27 countries put their water-related research to the test, vying to win the Stockholm International Water Institute (SIWI; Stockholm) award. From left, Crown Princess Victoria of Sweden stands with the 2012 Stockholm Junior Water Prize winning team Jun Yong Nicholas Lim, Tian Ting Carrie-Anne Ng, and Luigi Marshall Cham. Photo courtesy of Cecilia Österberg, Exray and the Stockholm International Water Institute. This year, a team from Singapore — Luigi Marshall Cham, Jun Yong Nicholas Lim, and Tian Ting Carrie-Anne Ng — won first place for their reasearch on how bentonite clay can be used to remove and recover pollutants from wastewater, according to a SIWI news release. The clay was able to absorb up to 100% of non-ionic surfactants. The team also demonstrated that after removal, the surfactants can be flushed clean with alcohol and reused, the news release says. The team received $5000 and a prize sculpture. 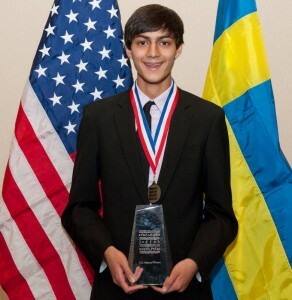 Kunal Sangani won the 2012 U.S. Stockholm Junior Water Prize. Photo courtesy of Allison O’Brien. Kunal Sangani of Fayetteville, N.Y., represented the Unites States with his project “Modeling and Environmental Analysis of Hydraulic Fracturing in Upstate New York.” For his project, Sangani examined various aspects of hydraulic fracturing (“fracking”) on groundwater resources in upstate New York and presented a model for understanding its potential effects on the natural environment and groundwater resources. In addition, at the international competition a Diploma of Excellence was presented to Alfonso Alvarez and Daniel Barrientos from Chile for their project, describing how salmon waste from the fishing industry can be used for biofuel production, the news release says. WEF President-Elect Cordell Samuels (left) and Xylem Watermark Director Michael Fields (right) stand with U.S. SJWP winners, from left, Natalie Ng, Taide Ding, Kunal Sangani, and Ajay Krishnan. Photo courtesy of Allison O’Brien. Members from the international SJWP winning team Cham and Lim, U.S. SJWP winner Sangani, and U.S. SJWP finalists Natalie Ng of Cupertino, Calif.; Taide Ding of Oxford, Miss. ; and Ajay Krishnan of Portland, Ore. will attend the Water Environment Federation (Alexandria, Va.) technical exhibition and conference, WEFTEC® 2012, Sept. 29–Oct. 3.